The church stood at the heart of monastic life and brought together communal worship, private prayer, ceremony and ritual. 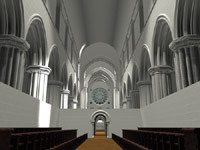 It was the most visited of the buildings and structured space and time within the monastery: the church dominated the precincts and determined the arrangement of the other claustral buildings; the monks day revolved around the eight Canonical hours that they celebrated in choir. A Cistercian church was defined by its simplicity. 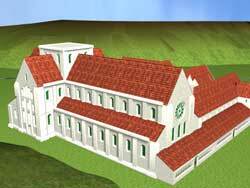 The White Monks rejected the lavishly ornate Cluniac churches, bedecked with fine furnishings and precious jewels. They considered these adornments superfluous, ostentatious, and contrary to the monastic ideal of poverty. Moreover, decoration was a potential distraction, and less likely to augment worship than to lead the monks astray. The General Chapter of Cîteaux issued extensive legislation restricting the decoration and furnishing of their churches. This included the prohibition of wall-hangings and paintings, as well as carpets and stained glass. Regulations about liturgical vessels and vestments were particularly rigid, and their High Altars were strikingly bare. stoles and maniples of silk only, without gold and silver. They also ordered the altar cloths to be made of plain linen without embroideries and the cruets to have nothing in gold or silver on them. Inevitably, the Orders prohibitions were not always observed everywhere, and there were infringements. In 1196 the monks of Fontfroide, Languedoc, were reprimanded for having a carpet in their choir; in the second half of the twelfth century the monks of Mellifont, Ireland, had a golden chalice, and other pieces of gold and silver that they had received from benefactors. (2) In response to external pressure, and perhaps also to current practice, the General Chapter modified and revised its position over the years. Nevertheless, simplicity remained the cornerstone of Cistercian ideology; their churches were not designed to please the eye, but were built and furnished for necessity and utility. (3) They were, accordingly, rather minimalist in appearance, with white interiors and sparse furnishings.